Austrian composer (1794–1868). Autograph musical manuscript signed. n.p. Oblong folio. 6 pages including title page. “Festive Song. For a programmed solo voice, accompanied by a choir and by pianoforte. 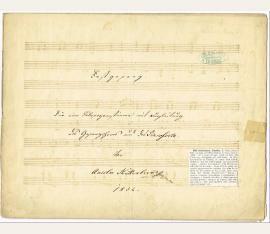 By Anselm Huttenbrenner, 1852.” Huttenbrenner pens the music and lyrics to the song in 47 four-stave bars. A central vertical fold passing through a single letter of the signature, scattered toning and soiling, partial separation to the spine, a few small tears (one repaired with tape), and a brief printed biography affixed to the front page, otherwise very good condition. 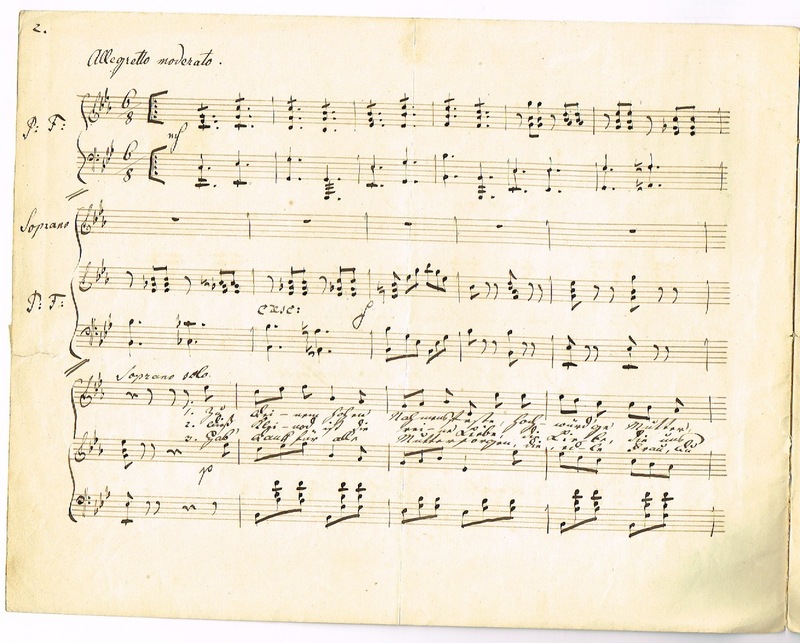 Komponist und Musikkritiker (1794-1868). "Festgesang". Autograph musical manuscript signed. Graz. Titel (mit montierten Überklebungen), 6 num. SS. auf gefalt. Bögen. Tinte auf Papier. Geheftet. Qu.-Folio. Song for Soprano and Alto with piano accompaniment ("Hör, o Würdigster, der Kinder Dankeswort"), entitled "Festgesang für 2 Singstimmen mit Begleitung des Pianoforte componirt von Anselm Hüttenbrenner mpr. 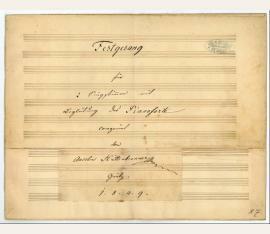 Grätz 1849" (above the notes: "Worte u. Musik von Anselm Hüttenbrenner mpr., im Juni 1849"). From Hüttenbrenner's late period, when he had already retreated from the Steiermärkischer Musikverein to his Rosenegg estate near Graz. "After his wife's death in 1848, he gradually sank into the habits of a recluse [...] His compositions include operas, sacred and secular vocal music, symphonies, overtures, chamber music, keyboard music and solo songs; few of his works were published, though most survive in MS. 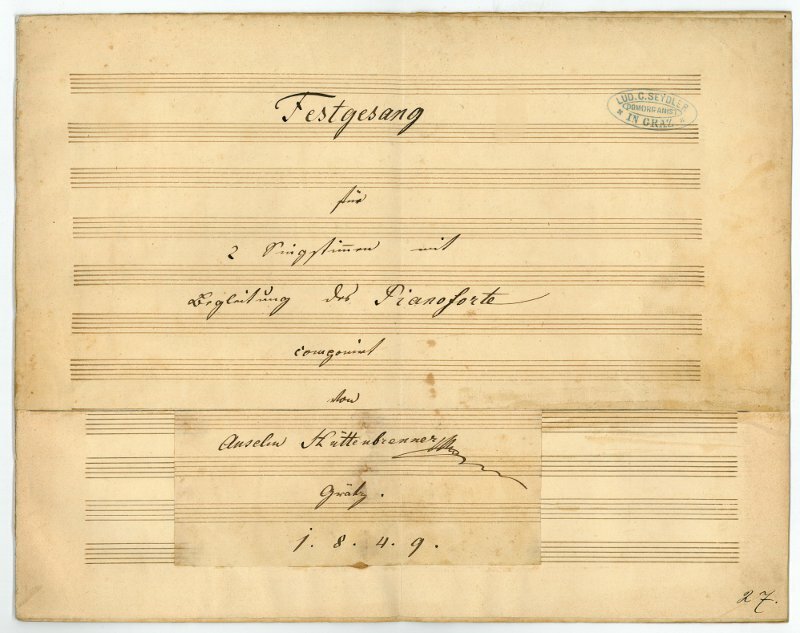 Many of his songs are melodious and have accompaniments that reflect the text; they appear to have been modelled on Beethoven's songs, rather than those of Schubert" (New Grove VIII, 829). - Traces of vertical folds. 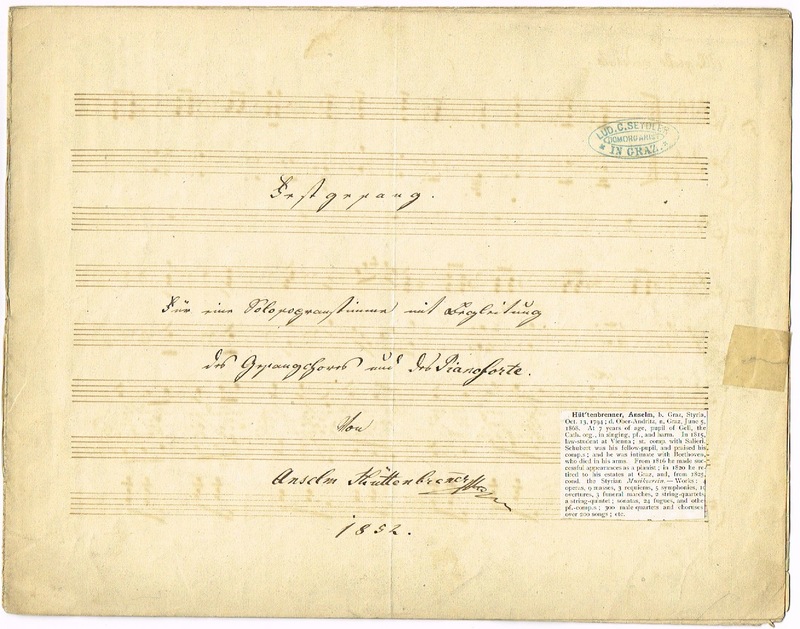 Collector's acquisition notes (dated 6 Dec. 1880) on verso of final leaf; title stamped by the Graz organist and Mozart scholar Ludwig Carl Seydler (cf. ÖBL XII, 207): "Lud. C. Seydler in Graz / Domorganist"..